When you walk through our house, you can see a plenty of little devices and gadgets resting in almost every room. As you could imagine, John and my boys are always in search for some cutting edge tools that can ease our daily needs. Of course, I approve almost all of these remarkable inventions, as long as they have a practical use. One day, I wanted to open some canned ﻿﻿salmon to make us some breakfast, but although we searched our kitchen, there was no can opener. Then, John tried to open the can with a kitchen knife. My John, I love how practical he can be, but this time the can remain invincible. Well, after the yammering, we all agreed that we need a REAL can opener. This time, we did the search together because there was no way that my boys would let me do this without them. There was no chance that they would miss the hunt for the shiny, metal, buzzing thing. And there we were, strong little expedition group in front of oceans of the internet. Below is what we had found when we searched for the best can opener. What To Look When Buying A Can Opener? Usually, when we are off to get a new piece of equipment for our home, we tend to have a top-notch tool that will match our needs. On the other side, we have a global market that is so large, and it comes with a tremendous amount of information attached to any product. But, you tend for the best, simple, durable and practical utensil. 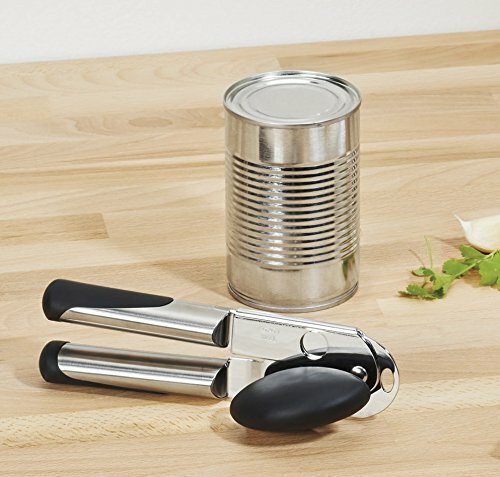 Nothing is different with can openers, and below you can find what makes the best can opener. Stainless-steel blades – and you shouldn't look at any other type because these are durable and resistant to rust. Comfortable use – this is related to manual can openers. The handle must have rubber or any other non-slip surface. Size does matter – manual can openers will fit any space in the drawer, while the electric ones must be tall enough to accommodate any can. Also, you have to provide a space on the counter or in a cabinet to fit the electric can opener. Robust and cumbersome construction – mainly related to electric can opener because it must be heavier than can so there will be no chance of flipping. Low-effort but smooth performance – if the can opener can't fit the can, if it slides down with mid-cut, or if the wheel gives you trouble when operating – look for another one. You need the can to be open, not "almost opened". The top-cut can opener will cut the top of the can, leaving the rim of the can intact. Further, if you release the top of the can over the can, the top will fall into the food. Also, the top-cut can opener will leave you with the sharp lid. But, most of the new top-cut can openers will come to you with the magnets, which will prevent the top of falling into the food. You will find that this class of can openers is attractive in the North America. The side-cut can opener does the opposite to top-cut can opener. It will cut the space where lid joins the can, and the result will be smooth edges on both sides. The parents with little kids commonly use this class of can openers, and the older ones as well, because it is considered to be safe. Also, a remarkable bonus is that the blades won't come in contact with the food, making the side-cut can opener more sanitary. Plus, according to users, because of this bonus, cleaning will remain on a minimal level, so you shouldn't worry about rust. This class of can openers you can often find in the UK. Downside – some users are complaining that in time, blades will become dull, so you will need to spin the can few additional times which may, or will, result with metal slivers. Manual Can Openers – are a good choice if you don't use canned food very often (E.g, canned chili). Using them is easy for some people - you have to turn the wheel or a crank, and the lid of the can will slide through the spinning blades, removing the top. On the other side, manual can openers are equally not liked among the older and the young people, because you need reliable hands and solid thump for operating. So, they are cheap, but often not comfortable. New manual can openers have ergonomic handles, but even with this design, some users are experiencing a hard time while using them, especially the ones with arthritic problems. Finally, they are not dishwasher friendly because they tend to rust. 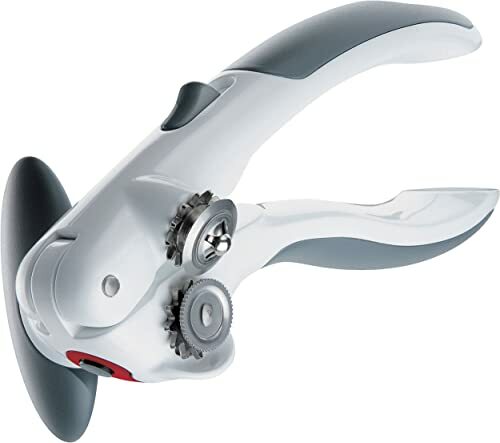 Electric Can Openers – we are impressed how much it is easy to use this kind of can openers. Simply, you push the button or flip the lever on some models, and the machine does the rest. Also, electric can opener has a magnet that holds the can while spinning it through the blades. As we can see, they are useful gadgets which can easily blend in the kitchen. You should know that these can openers will require a particular space in the kitchen, but don't be worried, there are space-saving types that you can find on the market. Furthermore, once you have removed the top of the can, the can opener will shut down until the next use. Some users may find this to be a downside, but we think the opposite. If the electric can opener, by some chance drops the can, this is a sign that it requires cleaning. Finally, electric can openers are easy to use by everyone. Well, we don't want to spend few hours while opening the can. At last, we have come to the reviews. Now we will see what the market has to offer to us, as we go through the five best can openers. This Can Opener has the reputation of the top selling electric can opener. 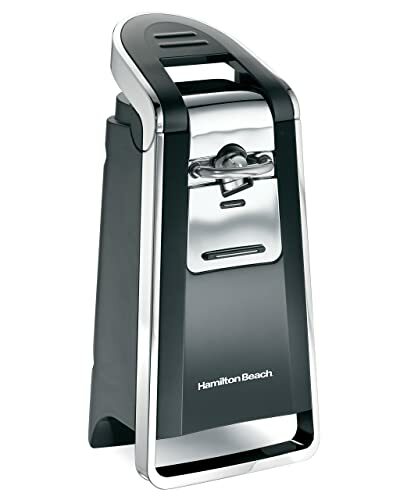 Hamilton Beach Can Opener is a side-cut electrical tool that uses the pressure to remove the lid, and the result is the smooth-edge opened can. As we can see from the reviews, operating with this can opener is simple – just push down the ergonomic lever, magnet locks the can, and the machine does the rest. The magnet is also necessary because there will be no metal slivers, and – the blades will not interact with the food. Also, there is no can that won't fit the Hamilton Beach Can Opener, so this makes an excellent bonus. Hamilton Beach Can Opener is about 10 inches tall, and it has a 5-inch square base. Its weight is around 4 pounds. Although it is not a space saver, the black design with chrome finish will certainly look beautiful in your kitchen. Also, this can opener comes with one-year warranty. Behind this remarkable product stands a variety of users, from young to old ones, and especially the ones with weak hands and with poor vision. Everything! It is a beautiful-looking utensil with good attributes and performance. Also, it is very affordable. It is big and cumbersome for a can opener, so you will have to re-arrange the space on the counter to fit it. But, where there's a will, there's a way. The description of the manual ZYLISS Can Opener may attract you to give this can opener a chance. This top-cut can opener, which has ergonomic and rubber non-slip handles. Because it is a manual can opener, you will quickly find a place to store it in your drawer of the cabinet. Further, it has magnet locking mechanism which will prevent the lid from falling into your food. On this model, blades are stainless steel, so you can put it dishwasher with no worry that it will rust; or, just dip the paper towel in soaped water and clean the blades. ZYLISS Can Opener comes in three colors: green, red and white, and with a five-year warranty. At this point, we were pleased with the description. Luckily for us, we have found some user reviews which have cleared our judging. ZYLISS Can Opener will give you smooth edges, and that is true. BUT, according to many users, magnet mechanism is weak and unreliable. Although it has Smooth turning mechanism, some users are complaining that the blades are getting dull after just a couple of times of use. Others are saying that even the firm grip on the can couldn't prevent the can of slipping through the blades. Sturdy and durable construction packed together with comfortable handles. Well, we could say it is easy to use. I think the magnetic mechanism is useless. The hard working people at Hamilton Beach has another nice looking gadget to offer to us. Similar to his cousin, The Hamilton Beach Smooth Can Opener, this one is also about 10 inches tall, and little over 5 inches square based. Furthermore, there is so much in this product that is worth mentioning. First thing, as it is said by the description and by the users, Hamilton Beach Heavyweight Can Opener is equipped with SureCutTM technology, and will smoothly open the can at the first time – every time! Naturally – WOW! The surprise effect doesn't end here. The chrome cutting mechanism is a removable one, which means that you just separate the cutting device from the body and wash it either in the kitchen sink or the dishwasher. A knife sharpener and bottle opener too? YES! When you finish opening of the can, the machine will shut down itself for the next use. Further, if you are tired of the chords that are spreading around, this can opener will save your nerves, because the storing of the electric cord when not in use is easy. Thick and firm construction packed together with excellent performance. We have found just one flaw from the user reviews – although it is tall, you may find that some cans won't fit very well. The OXO Steel Can Opener has a reputation for being the most easier to operate. It is a manual one, and while being the simple can opener, everything about him is large. Big, cushioned handles are specially designed to minimize the pressure, and the oversized knob will provide you with a smooth performance because you will be able to turn it quickly. Also, the blades are well sharp so that the opening process will go smoothly. Also, this can opener has a built-in bottle opener. As there will always be "but", this can opener has that too. OXO Steel Can Opener must be, and that will be "only washed" by your hands. Do not put it in a dishwasher. We find this to be confusing because the description says that blades are stainless-steel-made. Further, there are reports that the blades will become dull after a short period of use, or that the locking mechanism won't work very well. OXO Steel Can Opener won't leave any sharp edges. Sturdily constructed with non-slip grip. Not dishwasher friendly at all, only hand washable. The handles will bend in time when using too much pressure. The attribute "Extra-Tall" of this electric Proctor Silex Can Opener is justified. The users are saying that you will be able to open all types of cans, and especially the tall ones. Like many other electrical can openers, this one will also give you the ability to open the can at the first time, every time. The magnet lid holder comes together with the lasting blades so that the can will be in a tight grip. 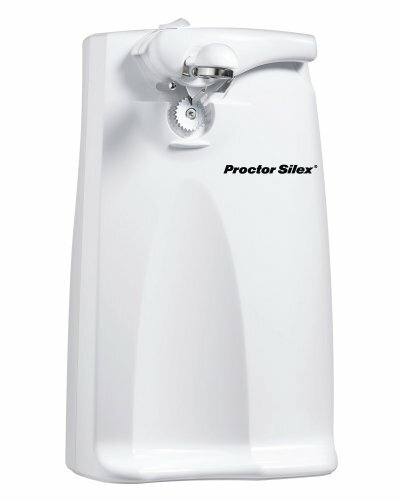 Furthermore, the Proctor Silex Can Opener has a cutting mechanism that can be separated from the rest of the machine and washed or by your hands, or in a dishwasher. It comes in white color so that it can blend in the most of the kitchen designs. Plus, it has a built-in knife sharpener, and it automatically shuts down after the use. Finally, it is very affordable, and this is what makes this gadget more attractive. Proctor Silex Extra-Tall Can Opener is affordable utensil with same attributes as any other competitor. The manufacturer doesn't say that this tool will give you smooth edges. There are reports that this can opener can cause splashes so that you will end up with the mess and cleaning. Well, after all these reviews, the manual can opener isn't the one for us. Although the manual can openers are excellent, and they come with sweet talk, the reviews are terrible. On the other side, we have three marvelous gadgets which are very similar, as in dimensions, as in performance. 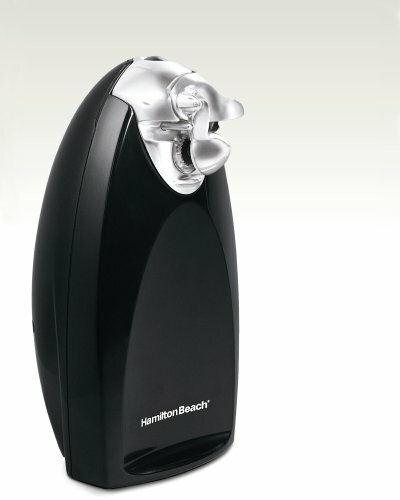 After a long time of observation, we have already ordered the Hamilton Beach Smooth Touch Can Opener. We think that although being the most recommended, it is a great utensil, and a must-have gadget. The boys are enthusiastic, and now we wait for the postman to come.